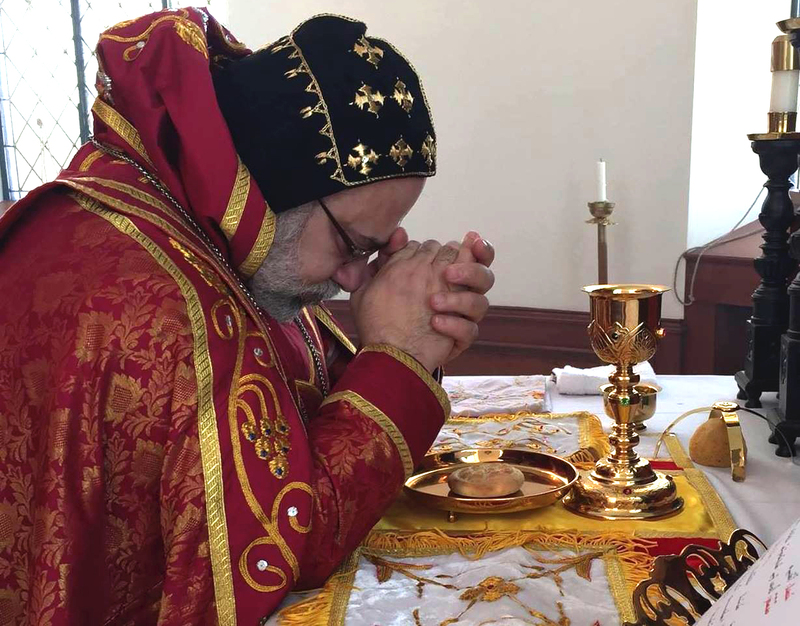 We extend our apostolic benediction, benevolent prayers and greetings to our brethren, His Beatitude Mor Baselius Thomas I, Catholicos of India, and their Eminences the Metropolitans; our spiritual children: Very Reverend Corepiscopoi, Reverend priests, monks, nuns, deacons and deaconesses and the entire blessed Syriac Orthodox people throughout the world. May the divine providence embrace them through the intercession of the Virgin Mary, Mother of God, and St. Peter, Chief of the Apostles, and the rest of the Martyrs and Saints. Amen. In a world where a brother becomes a stranger to his own brother, and where every human being lives alone searching for his own interest, every believer is reconsidering his relationship with God and with his fellow human being. He is thus building what hatred and egoism have destroyed, away from personal interest and racial, religious and confessional discrimination that divide the members of the one society who feel alienated from each other. Hence, the Holy Bible is setting for us the way to deal with strangers according to what pleases the Lord God. When the people of God settled in the land of Canaan, their relations with strangers multiplied; consequently, it became necessary to put rules for themselves for dealing with them. In the Old Testament, a stranger is the one who is different in faith, ethnicity or profession. The pagans who worshipped foreign gods and lived in the vicinity of Palestine, were strangers to the faithful children of Abraham, Isaac and Jacob. Similarly, the non-Jews were considered to be strangers because they were descendants of foreign nations. Most strangers lacked professional skills and worked in slave labor: “There were still people left from the Hittites, Amorites, Perizzites, Hivites and Jebusites, these people were not Israelites, Solomon conscripted the descendants of all these people remaining in the land — whom the Israelites had not destroyed — to serve as slave labor, as it is to this day” (II Chronicles 8: 7-8). Consequently, the life of a stranger in those times was not easy: they were powerless and had no authority. Their life was under the mercy of the Children of Israel. The Holy Bible commands: “Do not oppress a foreigner; you yourselves know how it feels to be foreigners, because you were foreigners in Egypt.” (Exodus 23: 9). The Book of Exodus also calls for some kind of equality between the indigenous and the foreigner who lives in the land, recommending that one law should rule among all: “The same law applies both to the native-born and to the foreigner residing among you.” (Exodus 12: 49). In the New Testament, the Lord Jesus Christ becomes a foreigner in the world of men by His incarnation. By becoming human, Jesus Christ has a new experience in a world strange to His divinity where He is with the Father and the Holy Spirit. The world, in which He was incarnated, refused Him: “He came to His own, but His own did not receive Him.” (John 1: 11). The Lord Jesus Christ gave a new meaning to the concept of stranger where true foreignness is to be stranger to God because of sin. Sin separates between God and men. It renders the sinner stranger to the Holy One. Moreover, living according to this world is a submission to sin and thus being foreign to God. Christians are dwellers on this earth but they do not belong to this world. As our Lord Jesus said: “you are not of the world, but I chose you out of the world, therefore the world hates you.” (John 15: 19). Hence, Christians are citizens of the Kingdom of God and Jesus affirms: “My kingdom is not of this world” (John 18: 36). Therefore, in this world, we are strangers, alienated from our spiritual homeland. We notice that the Holy Bible in general, and the New Testament in particular, teaches us to host strangers and to show philanthropy towards them. Doubtlessly, the stranger, refugee, immigrant and the internally displaced need more care than others since their suffering is great and their daily needs surpass their capabilities. Consequently, they are among those who need greater care because they are living under severe conditions and they are exposed to many dangers outside their villages, cities and countries. The Holy Church knows no limitation to charity and love: our Lord Jesus Christ taught us that “no one has greater love than this: to lay down one’s life for one’s friends.” (John 15: 13). The Church is a loving mother who cares for her children without discrimination, and teaches them to serve strangers and to host them. Since the beginning of Christianity, the apostles and holy fathers designated special hostels to host strangers. They selected some brethren to hold this responsibility to host guests and strangers, following the words of our heavenly teacher: “For I was hungry and you gave me something to eat, I was thirsty and you gave me something to drink, I was a stranger and you invited me in” (Matthew 25: 35). 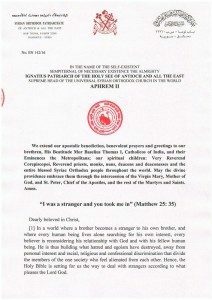 Today, Christians in the Orient witness a new persecution: killings, destruction, expulsion, forced emigration, and even uprooting them from their homeland. A large number of people are leaving their lands forcedly, subject to fear and anxiety, but led by the hope to live in a better place and under more humane conditions. Though we urge all to hold firm to the land of our forefathers, under such persecution, we have the duty to help them. Hence, they do not feel the indifference that people and even some faithful have sunk into. In this way, we bring back hope to the hearts of those who are about to loose it because of the crime and violence that surround them. We cannot forget the beloved Archbishops of Aleppo their Eminences Mor Gregorius Youhanna Ibrahim and Boulos Yaziji who are still forced to be away from us by those who do not know God and do not respect human beings. We ask you to pray for their safe return from their foreignness. Serving strangers and immigrants gives us the opportunity to serve Christ our Lord Who Himself was once an immigrant when His mother could not find Him a home to receive Him on His birth in the flesh, so “she wrapped Him in clothes and placed Him in a manger, because there was no guest room available for them.” (Luke 2: 7). He also experienced emigration when Joseph took Him to Egypt following the order of the angel to seek refuge there, away from those who sought His death (cf. Matthew 2: 13-15). At that time, He needed someone to host Him and offer Him a place to sleep. The holy family may have needed also someone to offer them a job, food, and other basic needs of life. When the Lord started preaching the Kingdom of God among people, once again He found Himself as stranger among His own, and therefore He said: “but the Son of Man has no place to lay his head.” (Matthew 8: 20). Therefore, dearly beloved, we are called to offer what we can in the service of others who are living under hard conditions by providing for them food, clothes and shelter. Thus, we render a service to the Lord Himself by fulfilling His will. Then, we will hear Him saying: “Truly I tell you, whatever you did for one of the least of these brothers and sisters of Mine, you did for Me” (Matthew 25: 40). The culture that the Christians in the Orient were raised into, is undoubtedly different from the one they find in the West. This difference is observed in the difficulty which the refugees find in integrating in the western societies and the incapacity to adapt fully to its requirements. We, therefore, impress upon our faithful who are resettling in the west to hold on to certain aspects of our culture that we do not want to change like our identity which we have to preserve and our Oriental Christian heritage which may be compromised in the West. We also need to work on reconciling many aspects of our culture with that of the western society without being affected by western atheism and secularism which may clash with our Christian values. Most importantly, we need to find ways to create harmony between the cultures of the East and the West so that emigration does not become a reason for the extinction of our culture. Emigration poses many important questions on the international level which simultaneously touch upon social, economic, political, cultural and religious domains. It sheds the light on the absence of social justice in some countries, or the lack of certain freedoms which are necessary for a dignified life. Moreover, there is an absence of the basic rights of human beings in certain countries such as the right to freely choose one’s confession and religion, and freedom of expression. Therefore, emigration is an action expressing the refusal of submission and giving up to the conditions imposed on us. It reflects the desire to lead a dignified life, preserve the basic elements of life and keep one’s rights and freedoms. Officials have started to discuss means of passing laws and constraints to organize and control emigration. They are doing so because emigration has become a tool to put pressure on countries which receive the immigrants. Some refugees are creating problems to the hosting countries which leads to more ethnic extremism and a growing sense of national fanaticism. Some are politicizing the matter in order to put pressure on countries, forgetting the human character of this issue and the necessity to deal with the refugees and immigrants as people in need of help, acceptance and attention. Refugees are faced mostly with maltreatment, discrimination, refusal and sometimes persecution. This increases their suffering after the difficulties and dangers they have gone through to reach their destinations. We are also aware of cases of persecution based on religious difference within the refugee camps in Europe. We denounce such acts and pray that the concerned authorities will take action to prevent such acts. We see that human trafficking also increased alarmingly lately as well as all sorts of abuse. We hear about the death of many immigrants or how they are killed by the smugglers before they reach their destination. During this great lent, we call upon our spiritual children to open their hearts and homes to receive strangers and immigrants, and to help the brethren who have been forced to leave their houses due to harsh living conditions and miseries in their homeland. Thus, they can receive the blessing of hosting strangers, as Abraham was blessed by hosting angels without knowing it (Genesis 18: 1-15). Dearly beloved, let us offer our hearts a place for the Lord to dwell in, for we read in the book of Revelation: “Here I am! I stand at the door and knock. If anyone hears my voice and opens the door, I will come in and eat with that person, and they with me.” (Revelation 3: 20). Thus, we will be ready to receive the Lord by offering true repentance. Fasting is an opportunity for almsgiving and charity that show our love towards our fellow human beings.